Tomato season has come to an end, for us. As usual, the pest and disease pressure have pretty well shut down the plants. It has been a good year. We put mosquito netting up over the tomato bed to keep the bugs out (as well as the birds and squirrels), and it worked, though not perfectly. Spider mites got in and wrought havoc. Armyworms and leaf-footed hoppers (stinkbugs) also managed to get in, but not in nearly the numbers that they did last year, when our crop was almost entirely a loss. So, success. But the happiest surprise of the season came when it was time to uproot the plants. 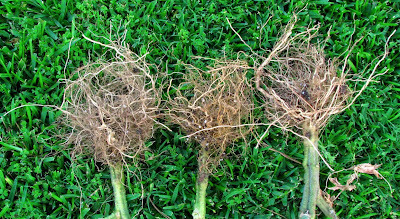 As you see above, they have very normal-looking roots. This is the first time we've seen normal-looking roots on our plants. You see, ever since we built the garden beds and filled them with sandy soil, we have had root-knot nematodes. 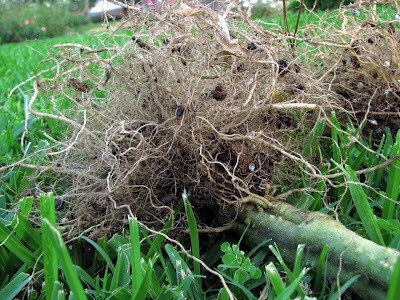 We have tried several controls in the past, but at the end of the tomato season, the roots are always galled and ugly. The most-recommended treatment is to plan Elbon cereal rye as a cover crop, over the fall-winter, and till it in some weeks before planting out tomatoes. Well, we couldn't find Elbon cereal rye, but we did find rye grain in the bulk bins at Central Market. We bought a half-pound or so, and tried sprouting it. It came up very readily, so we planted it all over the tomato bed. It grew into a nice thick lawn of grass. In January, we dutifully turned it under to allow it to break down into the soil. In theory, the nematodes have attacked its roots and doomed themselves, or been poisoned by chemicals the rye gives off. Maybe some of both. I don't know. But I do know that those roots look beautiful to me.